Fermentation generally means respiration of an organism without the use of oxygen. Some bacteria and yeast often spoil food they live in, and some are useful to the mankind. They produce antibiotics, enzymes, washing powder, alcohol, yoghurt, and other useful food items and products. To make use of these we need to grow these microbes in large scale. This is called bio-processing and involves culturing them in the nutrient field in a stainless steel vessel call bioreactor or fermentor. The metabolism of carbohydrates meets with different fates as it is subjected to different enzyme systems, different locales of reaction and most importantly, the presence or absence of oxygen. The carbohydrates like glucose, fructose, etc., breakdown into two molecules of pyruvate. In the presence of oxygen, the pyruvate is oxidised into CO2 and water with liberating of energy. But in the absence of oxygen, that is anaerobically, they are converted into lactic acid by the process of lactic acid fermentation as seen in humans and other mammals. The hydrogen atoms held by NADH are transferred to pyruvate, which in the process is reduced to lactate. Examples: (i) Lactic acid bacteria ferment milk sugar into lactic acid. The breakdown of food molecules into simple sugars which take place in a human body is called glycolysis. It means splitting of sugar molecule into two molecules of pyruvic acid is called glycolysis. It generally takes place in the cytoplasm and the path way used is called anaerobic pathway. Glycolysis is the path where glucose is broken into pyruvate and fermentation of process of formation of lactic acid by breaking pyruvates. They produce reducing agents without oxygen. 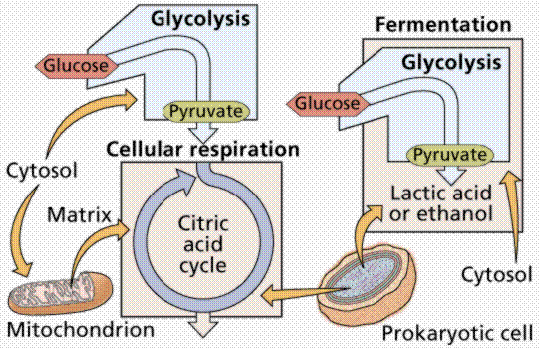 Glycolysis appears before fermentation .They both occur in the cytoplasm. Want to know more about Glycolysis? Click here to schedule a live help with an eTutor!